Our range of products include salt spray chambers. Innovation is our forte and we strive to manufacture and supply a quality range of Salt Spray Chambers. Extensively used in industries like Pharmaceuticals and Chemicals, offered chambers are manufactured in compliance with GMP regulations and ICH guidelines. 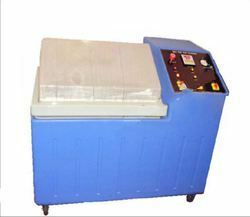 Also, our professionals make use of optimum quality material and modern machines to manufacture these spray chambers. Rigorously examined on different quality parameters before the final dispatch.